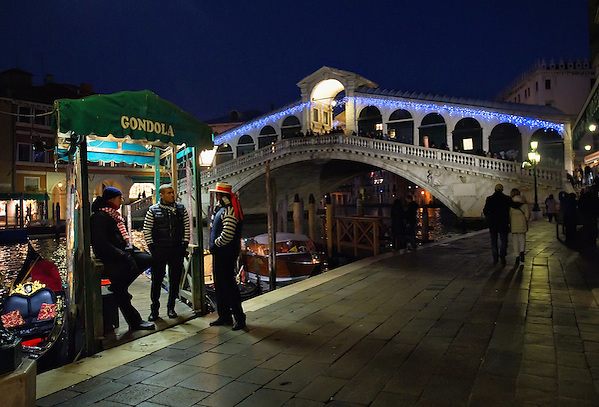 What can you do if you are visiting Venice during Christmas time? First of all, you can have a quiet walk in a less crowded city, with a magical mist and Christmas lights on the houses and on the canals. In St. Mark square you will find the Christmas Tree, and you can walk under the porticos of the Procuratie, where the ceilings are decorated with luminous rows that recall a cascade of snowflakes.In Calle XXIII Marzo, the street of the luxury shops, you can make shopping under luminaries that create a unique atmosphere with the ancient palaces. Soak up the festive atmosphere by strolling through the streets and lingering in squares or churches to listen to choirs singing and the church bells ringing. On Christmas Day itself, the bells ring out all day from St Mark's Bell Tower. If your walk has left you chilly warm up with a hot chocolate in Caffè Florian on St Mark's Square. Do you want to buy some typical food or some artisanal gift? Take advantage of the Christmas Market in Strada Nova and Accademia area, maybe drinking a glass of Vin Brulè (typical winter hot wine) to warm up a little. In Campo San Polo there is the ice skating rink, fun for adults and children.Are you classical music lovers? If the answer is yes, the Venice Christmas season offers a variety of concerts. Many Venetian churches for Christmas o organize evening shows: from traditional Christmas songs to more modern tunes performed by international singers, in short, shows for all tastes.And you cannot miss the Santa Claus Run on 16th of December, starting from Campo San Giacometto, close to Rialto Bridge. 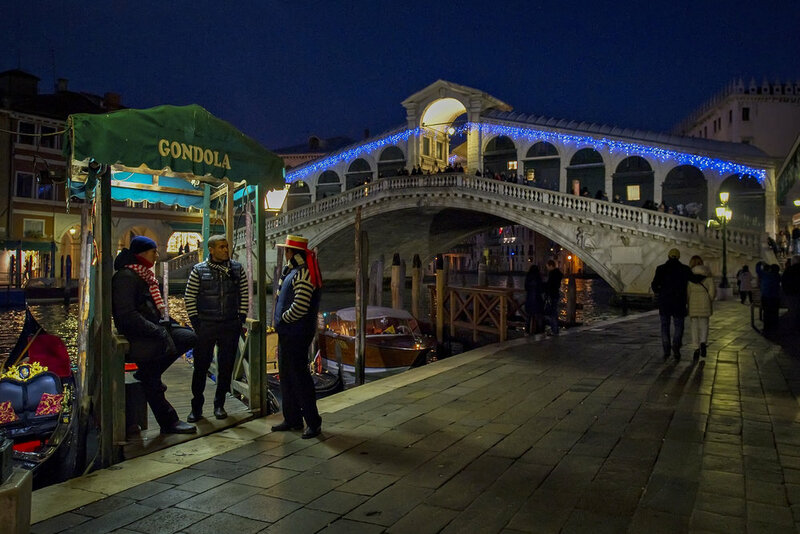 Venetians have their main Christmas celebration on Christmas Eve or “La Vigilia”. Families traditionally tuck into a fish dinner of several courses before heading to midnight mass. If you want to join them, services at St Mark's Basilica start at 11:30 p.m. and are conducted in English, French and German as well as Italian. VENICE, ITALY - JANUARY 06: Two of the participants sail under Rialto Bridge on the Grand Canal ahead of the 34th Befana Regatta on January 6, 2012 in Venice, Italy. 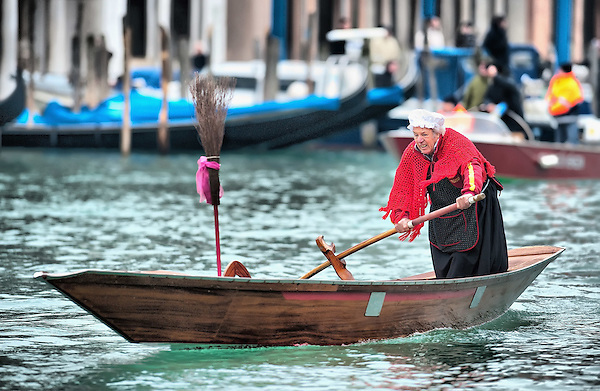 In Italian folklore, Befana is an old woman who delivers gifts to children throughout Italy on the feast of the Epiphany on January 6 in a similar way to Saint Nicholas or Santa Claus. The Feast of the Epiphany, celebrated January 6 with a national holiday in Italy, and the tradition of La Befana are a big part of Italian Christmas celebrations. Epiphany commemorates the 12th day of Christmas when the three Wise Men arrived at the manger bearing gifts for Baby Jesus. The traditional Christmas holiday season in Italy lasts through Epiphany.On Venice’s Grand Canal, at 11 c'clock men dressed as old witches – ‘befane’ in Italian – race towards the Rialto Bridge, standing up as they row Venetian style. This event takes place every year in January in celebration of Epiphany. Best places to watch the race: Rialto but you must get there quite early, Riva del Vin or just around Rialto Mercato. Gondoliers dressed in 16th century costumes ferry people performing a Nativity scene from St Mark's to the Island of San Giorgio. 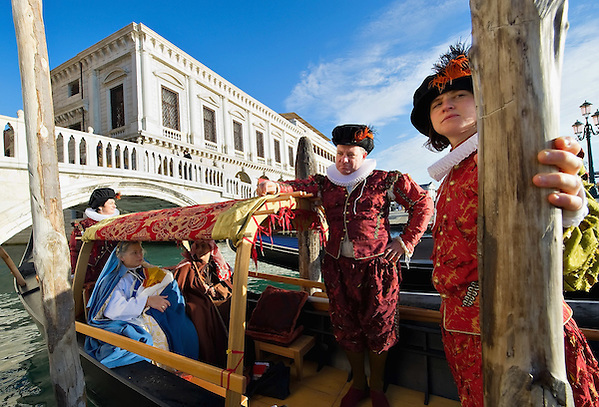 The event, in its first year, replicates the ancient tradition when the Doge of Venice used to travel to the Island of San Giorgio on Boxing Day to celebrate the relics of Santo Stefano. NOALE, ITALY - DECEMBER 18: Participants dressed as Father Christmas take part in the Noale Sant Run on December 18, 2011 in Noale, Italy. 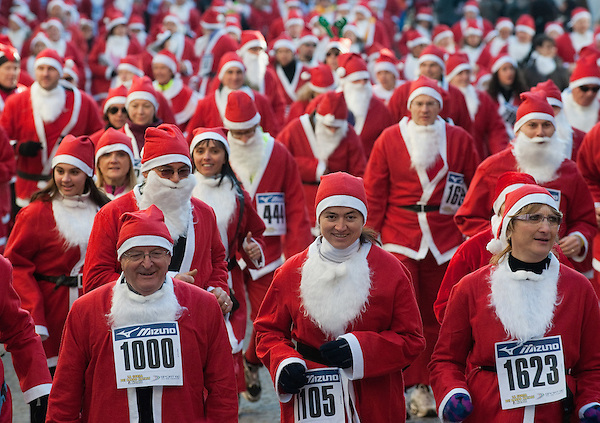 Close to two thousand people participated in the third annual Noale Santa Run, one of the largest non competitive Santa Run in Italy. While preparation are taking place in Venice and the Lagoon for Christmas here are few tips:A wonderful way to spend Christmas Eve is to attend midnight mass at St. Mark's Basilica. But remember, midnight mass starts at 10:30 p.m. and you should get there early to get a seat (no tickets are needed). Try to enter through the north entrance and not the west entrance often used by tourists. Even though December 26th is a national holiday (St. Stephen's Day), most of Venice's museums and sites will be open. 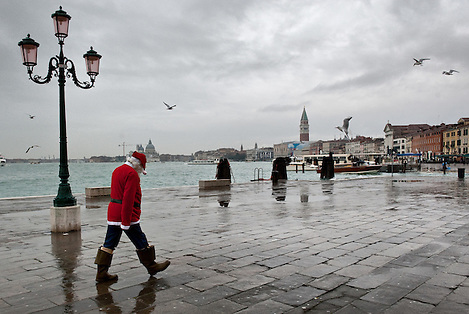 Several Venice restaurants are closed on Christmas Eve and Christmas Day and even on the 23rd and 26th. Most hotel restaurants and Harry's Bar are open. Be sure to do your homework and make reservations ahead of time for Christmas meals. We hear Caffe Quadri and the restaurant - Piazza San Marco's famous cafe - is open on Christmas Day. Good place for Christmas breakfast and coffee! Remember that the vaparetto schedule changes on major holidays. Check the signs posted on the platforms for schedule information. Each year on December 26, the Frari Church in San Polo (in the Campo dei Frari) offers a free concert at 4:00 p.m. The church is filled with magnificent art, including Titian's Assumption of the Virgin, Canova's Tomb and a carved monk's chair from 1468. For an incredible seafood dinner and a warm celebration at midnight, go to Trattoria Antiche Carampane on New Year's Eve. (San Polo 1911; (39) 041 524-0165) The price for dinner runs about £70 per person. No matter where you go that night, you must make reservations. Another restaurant recommendation: Antica Trattoria Poste Vecie (Rialto Pescheria Venezia; (39-041-721-1822) is open on Christmas Day and New Year's Day. This restaurant also has excellent fish and a larger menu as well. The soups and Venetian-style calf's liver are terrific. Fireplaces keep the restaurant warm on cold nights. 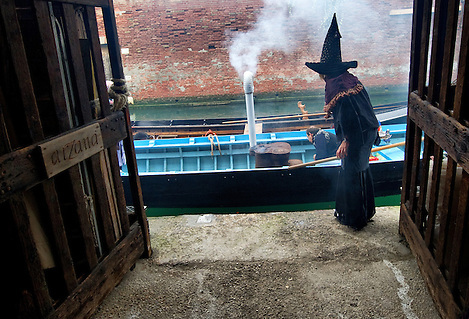 If you're in Venice on January 6, don't miss the Befana races. Men clad in long skirts, wigs and babushkas climb into boats for races on the Grand Canal. 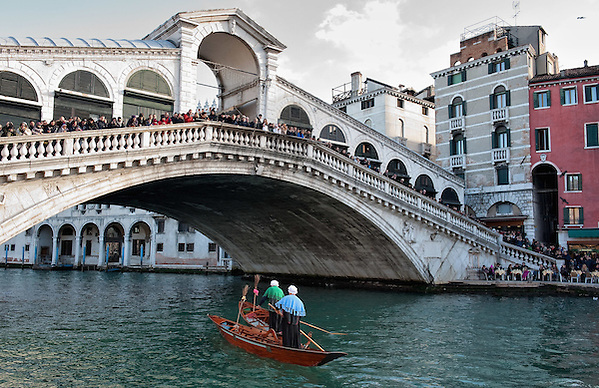 The best views are from the Rialto Bridge. La Befana vien di notteCon le scarpe tutte rotteCol cappello alla romanaViva, Viva La Befana!